When the mood strikes, there is nothing quite like a hearty curry, but, with the weather hopefully on the up, sometimes you want a lighter version of your favourites so if this is the case then this is the dish for you. The idea behind this is that the chickpeas are coated in a sauce that doesn’t weigh it down so you can taste and appreciate all the ingredients. Paneer lends itself to pairing with a range of Indian flavours and I have kept this paneer fresh with herbs and the zing of lime. If you can’t find garlic and ginger paste then substitute it with a garlic clove and a freshly grated piece of ginger. The paste is available in all good Asian supermarkets and is well worth buying if you come across it as it can be used in a wide range of recipes and takes the time out of having to make your own. There will be leftover toasted lentils but fear not; they are delicious sprinkled over salads or as a snack by themselves and will keep for several days if covered over. 1.I started by toasting the lentils and chickpeas first so I could then concentrate on the other elements of the recipe. Preheat the oven to 200c/ 180 fan; pat the lentils as dry as you can after draining them, place them on a baking tray and drizzle with the olive oil. Add the salt, garlic powder and chilli flakes and toss to coat the lentils. Place in the oven and cook for around 15 minutes or until crunchy; you can move them around on the baking tray halfway during cooking if needed to ensure they are evenly toasted. 2. As the lentils are cooking, place the chickpeas in a deep roasting tray and add half of each of the spiced listed apart from the garam masala. Toss to combine and roast in the oven for 15 minutes at the same time as the lentils until they have started to gain some colour. Remove the chickpeas and lentils from the oven when they are ready and set aside. 3. To make the curry base, add a glug of olive oil a wide bottomed pan that is large enough to hold the curry in its entirety. Over a low heat, gently cook the red onion until softened and starting to turn golden; add the tomato puree and cook this out for another minute. Add the remaining spices apart from the garam masala and the ginger and garlic paste as well as approx. 200mls of water; stir to form a paste. Add in the vegetables and chickpeas and simmer until the sauce lightly coats them; if it gets a little too dry then add another splash of water or two. 4. For the paneer, mix together all the ingredients listed under the paneer section of the ingredients list; taste and adjust seasoning and/ or the lime juice to taste if needed. Toss the paneer cubes in a tablespoon of cornflour. Add a good glug of oil to a non- stick frying pan and add the paneer; fry over a medium heat until the cubes are golden and crunchy. Remove using a slotted spoon and blot any excess oil using kitchen paper. Add the paneer cubes into the mint, coriander and lime dressing and toss well to coat. 5. To assemble the final dish simple choose a large serving dish and spoon the chickpea curry onto it. Top this with the herby paneer and finish with a liberal sprinkling of the crunchy lentils. Add extra fresh mint and coriander if you like and serve. 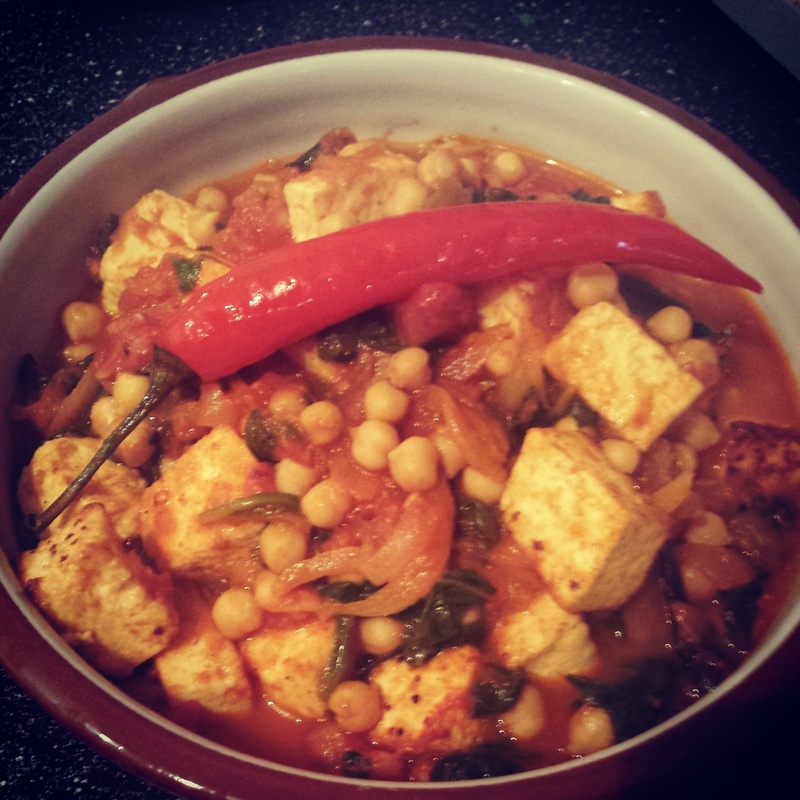 Lime, coriander and mint paneer and spiced chickpeas- a lighter take on a curry for the summer! With autumn upon us it sees the return of squash and kale in my kitchen on a regular (and borderline obsessive!) basis. Squash and kale daal is not exactly an authentic Indian recipe however it is absolutely delicious.The combination of the two adds sweetness, earthiness and even more vibrance to the daal. Spinach is often an addition to daal but this is my autumnal twist on it. The base of the daal is very simple and the spice mix is added later on in the cooking process so the ingredients come alive. I have kept the spices whole to add bursts of flavour however you can lightly bash them with a pestle and mortar before frying if you prefer. 1 Kick off by rinsing the lentils in cold water. Place on the hob in a large pan and cover the lentils with water. Bring the water to the boil before lowering to a simmer. Skim off any scum that forms on the surface of the water. Add in the garlic, ginger and turmeric. Simmer the lentils for 1- 1 1/2 hours until the lentils have softened. 2. When the lentils are about 20 minutes away from being tender and creamy, peel and chop the butternut squash into small chunks. Wash and roughly chop the kale and add, along with the squash, into the pan. 3. In a separate pan, heat the oil or melt the ghee, depending on which you prefer. Slice the shallots and fry until turning golden. Pop in all the other spices and whole chillies; fry until colouring and releasing their flavours. Tip the spice mixture into the lentils and stir through. You may also like to hold a little back to use as a topping. Serve the daal in warmed bowls and sprinkle over some freshly chopped coriander if you like. Also serve with chapattis on the side. 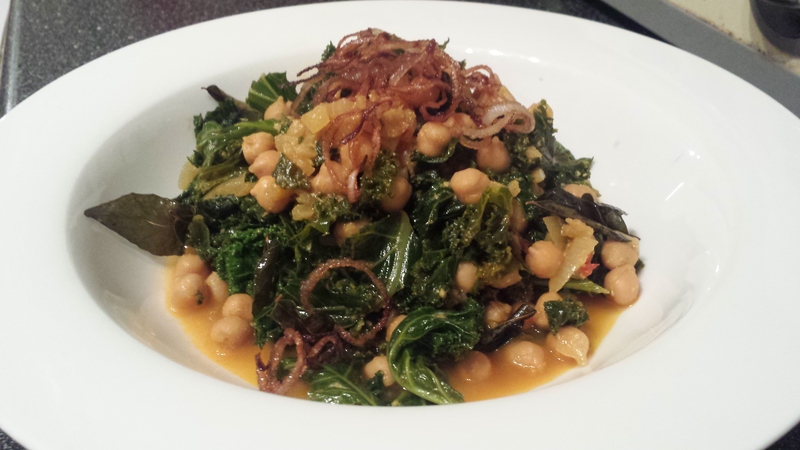 Squash and kale daal- a hearty, vibrant dish for a chilly autumn day! Read on for an Indian feast fit for a king! After a summer full of meat laden BBQ’s it’s time to rediscover seasonal vegetables and to get creative. Paneer, chickpea and spinach curry: This has become a firm favourite in our household and makes use of the tastiest vegetables around. Paneer is a firm, mild Indian cheese and can be used as a meat substitute so give it a go! 1. Firstly heat the oil in a large saucepan over a medium heat and add the mustard seeds and curry leaves. Heat the pan until the mustard seeds begin to become fragrant, pop and sizzle. Reduce the heat to low, add the onion and cook until golden. 2. Now it’s time to make the paste- that’s right, homemade paste, none of this ready made stuff! This is so simple so combine the ginger puree, garlic puree, turmeric, curry powder, chilli powder and a little water. You are after a thick, rich paste so gradually add the water- you will only need a tablespoon or two. If you fancy paneer with an extra layer of flavour you can reserve a little of the paste and coat the paneer in this. 3. Add the paste to the onion in the pan and cook for a couple of minutes. I then add in the fresh chillies (you can use milder chilies if you prefer or pierce the chillies if you want to release a bit more flavour). Add the chickpeas and stir gently so they get a delicious coating of the paste. 4. Add in the tomatoes and simmer on a low heat whilst you prepare the paneer. This is the perfect time to cut the paneer into 2cm cubes and to fry off in a frying pan so they turn golden on all sides. If you have reserved some of the curry paste this is the time to mix with the paneer before frying off. 5. Simmer the sauce for 20 minutes and then add in the spinach. Continue to simmer until the curry sauce is thick and rich. Just before it’s ready sprinkle over the garam masala and stir in. Serve in warmed bowls with chapatis alongside. 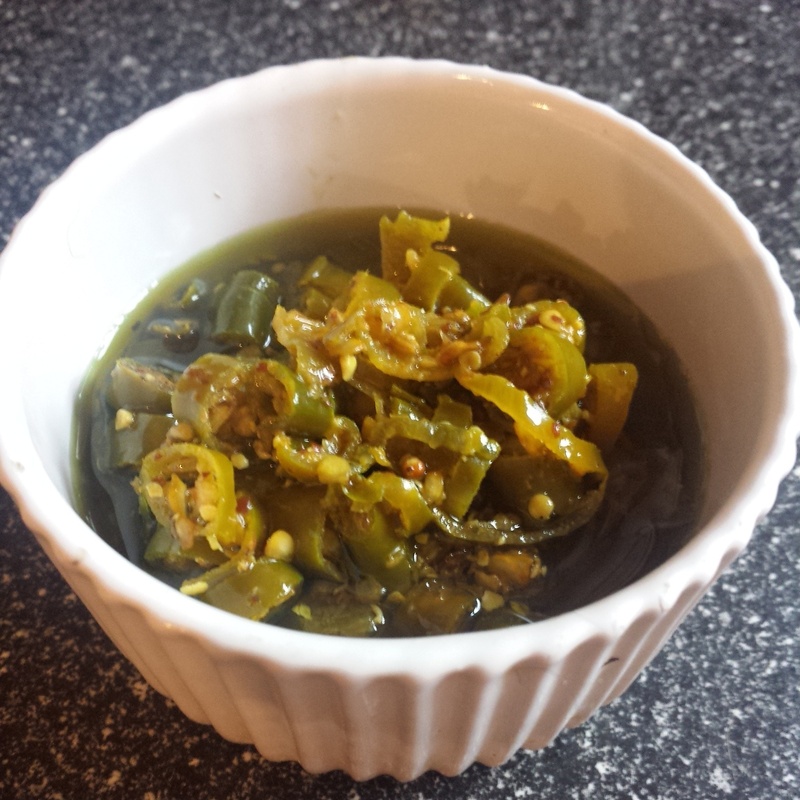 Green chilli pickle: This is not for the faint hearted but if you are not a fan of heat then you can choose milder chillies. I make use of my local market and stock up on green finger chillies which you can pick up cheaply. This pickle lasts well and I store mine in a Kilner jar in the fridge so it is on hand for when a curry calls so it is worth making a jar of it at a time. Asafoetida is relatively easy to find these days so I would recommend trying to get hold of this. 4. The pickle needs to be kept in air tight jar (I use Kilner jars which have a proper seal) and make sure the jar is properly sterilised. Now it’s time to mix the pickling spices, chillies, lemon juice and oil together and give a good old stir before putting into the jar. I then push the chilli mixture down a bit with the back of a spoon to level it out a bit and you can then top it up with extra oil if needed in order to create a protective layer if you find the chillies have absorbed some of it. That’s all there’s to it! The pickle can be used straightaway however I like to leave it for at least a day to develop the flavour- if you resist! The longer the pickle is kept, the punchier it will get! 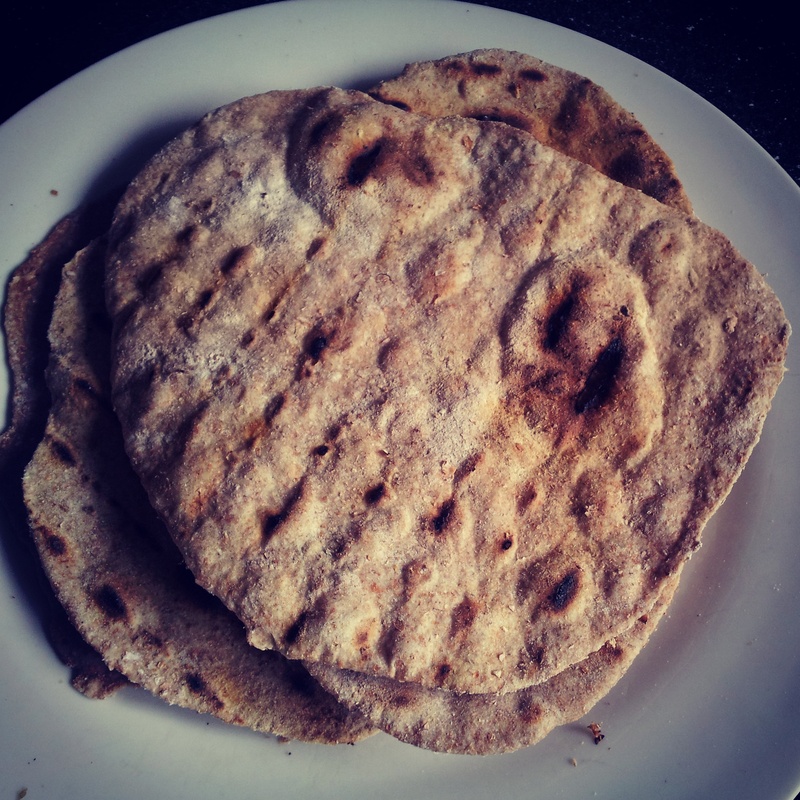 Homemade chapatis: With a bit of effort you can enjoy authentic chapatis which will rival those from even the best Indian restaurant! These are also freezable and I would suggest interleaving each bread with a cling film sheet so they don’t stick together. 1. Put 200g of the flour to one side to help with the shaping of the chapatis and place the remaining flour in a deep bowl. 2. Add the cold water gradually to the flour and be sure to knead as you combine the two until you have a soft dough. As rule of thumb, the longer you knead the chapati dough, the softer it will be resulting in a tastier chapati. 3. Lightly flour the work surface and divid the chapati dough into 8 pieces. Shape each piece of dough into a ball. 4. Take each ball of dough one at a time and flatten slightly before rolling it out to achieve a disc of approximately 15cm in diameter. Remember to use some of the leftover flour as you go to keeo the dough from sticking to the surface. 5. Heat a griddle pan to a medium/ high heat and cook each chapati for around 30 seconds until the chapati begins to bubble up and turn golden. Serve on the side of your favourite curry! 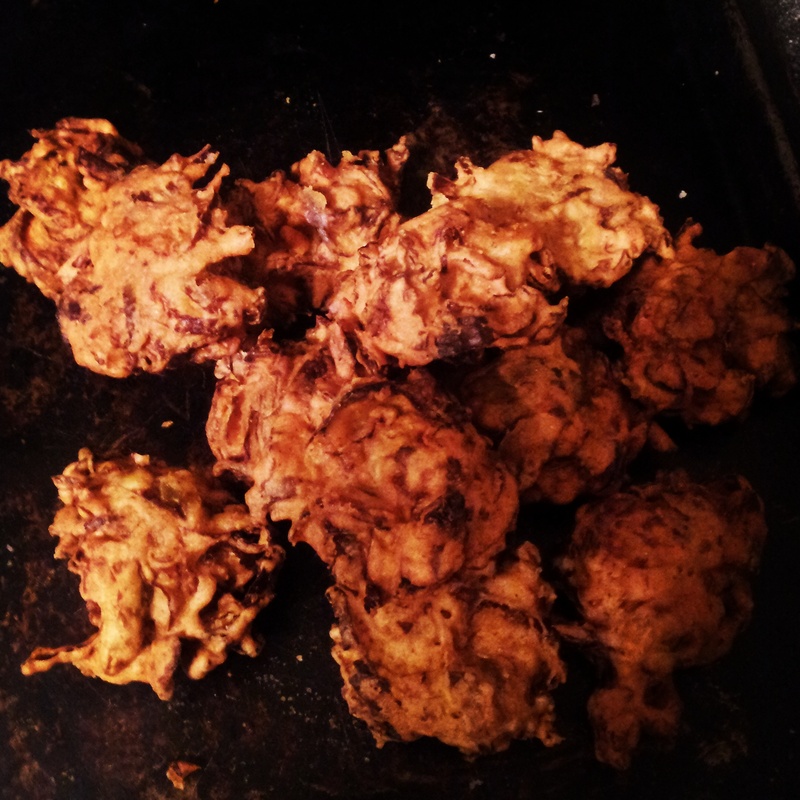 Onion bhajis:These bhajis are quick and easy to cook. Once you have mastered the basic recipe the ingredients can be tweaked so try experimenting with other vegetables. It is important to make sure you use chickpea flour as this gives a lighter, crisper bhaji.One of my personal favourites is a Brussel sprout bhaji which will convert even the fussiest of eaters! 1. Sift the flour and baking powder into a large bowl to ensure there are no little lumps. Add the chilli powder, dried chilli, cumin and a pinch of salt. 2. Add 150ml of cold water to the mixture to create a thick, smooth batter. I gradually add the last 20- 30mls of water to make sure the right amount is added. To the batter, add the onion and stir well to ensure the onion is well coated. 3. Now this is the bit where you need you wits about you! Heat enough vegetable oil in a large pan so that it is 3- 4cm deep and bring it up to a medium/ high heat. When you think the oil is hot enough drop a slice of onion in it to double check- if the onion sinks and then comes back up to the surface then it is ready. Add heaped tablespoons of the onion mixture to the oil and fry until golden. Don’t overcrowd the pan when frying- I usually do 2 at a time. When the bhajis are golden, carefully remove them with a slotted spoon and blot onto kitchen paper. The bhajis are best served warm and fresh however they can also be gently reheated- that’s if you havent already demolished them all! So there you have it, an Indian feast and not a takeaway menu in sight!